Push to Talk support has been enabled. Near Field Communication (NFC) feature has been enabled. Improved home screen responsiveness reduces touch screen lockups. Trackpad will respond the first time when touch screen is used to maximize or minimize the icon application grid and trackpad is clicked. Opening an application and pressing the Back key will no longer cause the application switcher to appear. Cursor will acknowledge and react by stopping scrolling when reaching the end of the screen. No longer receive an “uncaught exception” error. Proper rendering when scrolling within the Universal Search feature. Turning off the wireless connection will not cause the device to restart unexpectedly. View SMS text messages or emails in their entirety. When sending an SMS text message that extends to two pages, all text will appear correctly. Text messages appear properly with the ability to download attachments, if applicable. View Folders within the Messages application (Menu > View Folder). Turning Geo-location on and off will no longer affect the browser application performance. Maintain data service when moving from foreign network coverage to home network coverage. When ending an incoming voice call, your smartphone will remain active. Receive incoming calls without interruption. While on a call, pressing Menu > Add Participant will properly place an additional call. Successfully log in with your BlackBerry ID when connected to your corporate Wi-Fi network. The device will remain connected to WWAN after downloading a file using VZAccess Manager and disconnecting the device from your computer. City ID information displays properly with a contact’s company information within the Phone application. I'm not sure how many of you out there experienced any of the issues above but if you have -- best to get this update installed so that they can be cleared up. 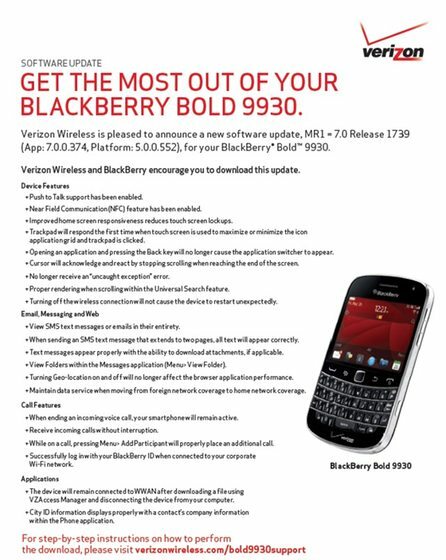 You can discuss more in the CrackBerry forums or hit the source link for the direct download.